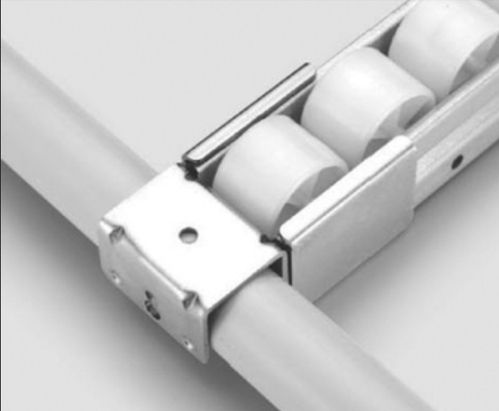 Roller track mounting brackets are available to mount roller tracks available in 40 mm and 80 MM sizes with stopper . Hitech Pneumatics is established in year 2010 and are ranked amongst the dominant enterprises devotedly involved in Pneumatic components & hydraulic products for the Automation Industry with Regd office at Sikanderpur Gurgaon and branch office at Sector 40 Gurgaon and is a well established name in the Automation industry. HITECH represents World renowned companies like John Guest (UK), EQO FLUIDS (Spain), Nitto Kohki Japan for Quick Change couplers, Legris for PU Tubes, FRLS, Ball Valves, Solenoid Valves , etc and sources products globally related to the pipe and fittings industry for compressed air, inert gases, Plumbing, pure water and vacuum applications. On account of representing companies which are foremost leaders in their applications, HITECH offers comprehensive solutions for more than 10 different fluid media and in a wide ranges of temperatures and pressures unmatched by any other company in India. Having executed more than 50 projects to date in North India, HITECH offers the world’s most respected brands under one roof with the advantage of sourcing the Aluminum pipes from Reputed Suppliers from INDIA of the same material and workmanship offered by foreign makes. Thus by offering a comprehensive solution, HITECH ADVANCE PIPING SYSTEMS is considered as the most cost effective solution in the Indian industry for any piping application using world’s best components. HITECH also has its own service team who can Install and supervise correct installations procedures ensuring the piping system does not give way even after the 10 year warranty has expired. Piping erection and commissioning being our core competency, we are able to properly erect, install and execute Piping projects using qualified welders, piping engineers and experienced installers ensuring a lifelong and safe installation. John Guest Advance Piping Systems UK also offers close to 0% leakage in their piping systems which mean years and years of leakage free air which also means MAJOR savings in energy costs. Traditionally, engineers have specified a variety of piping materials for compressed air systems, including black iron, galvanized steel, copper, stainless steel and even plastic. More recently, aluminum piping has become an option considered by many contractors, architects and engineering firms. Aluminum piping makes sense for compressed air systems in many different applications. Contractors are familiar with these materials.